Support this site by purchasing some logo gear or other items. Prices include shipping. Please note your item, size (if applicable), and shipping address when you click on the link to "paypal.me/TeachOutside." Thank you in advance! 12" X 2.75" White Vinyl Sticker with Black Ink. Black logo on an olive drab 100% cotton regular cut Gildan t-shirt. Available in small, medium, large, extra-large, and XXL. 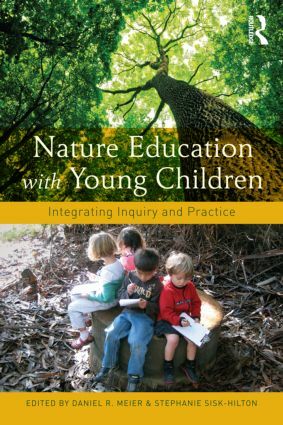 "Nature Education with young Children"
Daniel R. Meier and Stephanie Sisk-Hilton, eds. Forward by Lella Gandini with Camille T. Dungy, Mabel Young, Gita Jayewardene, Darcy Campbell and Shawna Thompson, Anna Golden, Marty Gravett, Jean A. Mendoza and Lilian G. Katz, Heather Taylor (my chapter is entitled "Promoting Play in a Preschool Garden and Using a Blog to Document Children's Nature Explorations" and is very how-to, even for programs serving older children), and Isauro Michael Escamilla. Your donation in any amount helps support the work of this site and associated expenses. This web site is $144.00/year. The domain name is $140.80 with each renewal.